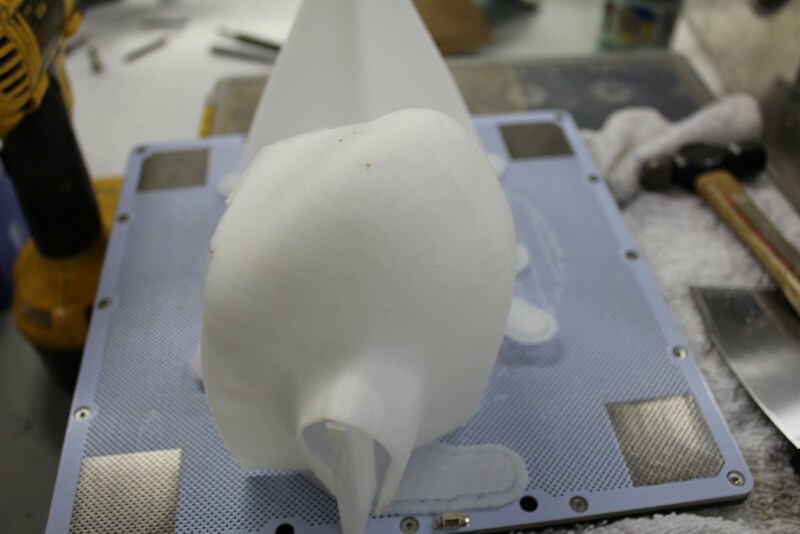 This page will be dedicated to the 3-D printing process for components used on the EMG-6. The trailing edge lift strut eye bolt also has a large protrusion with the nut and washer sticking up above the rear spar. This is our fairing that fits over that nut to reduce the drag in this area. This is prototype #1 and was a pretty close fit from the get-go but needed a few modifications. 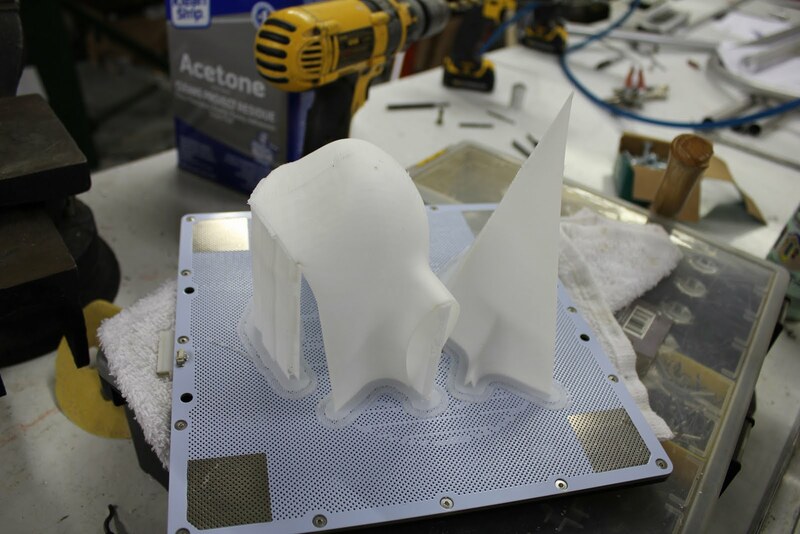 During the 3-D printing process there are several steps that take place. 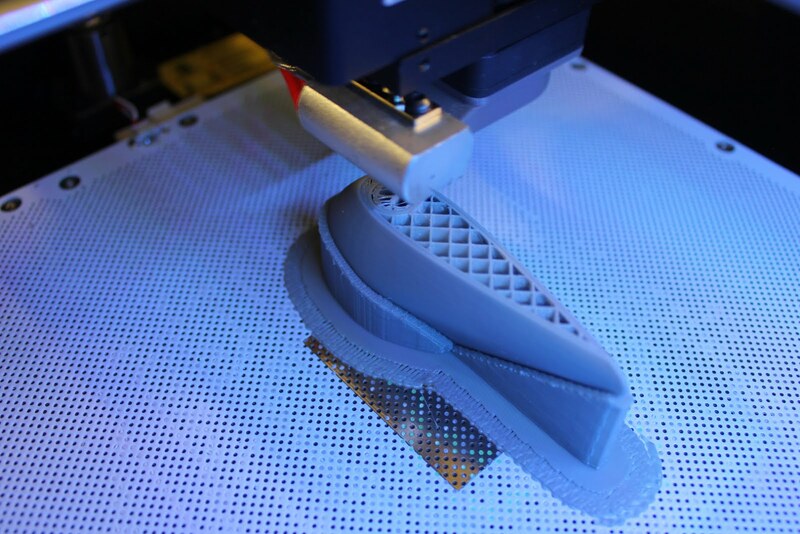 The 1st step is that the 3-D printer lays down what is called a raft. That is the support structure that sticks to the build plate that will be discarded but provides a platform from which all of the other printing takes place. One of the unique characteristics that you can do with a 3-D printer that is nearly impossible on any other type of manufacturing is the ability to put a honeycomb or lattice structure inside of the part reducing the weight and increasing the strength. 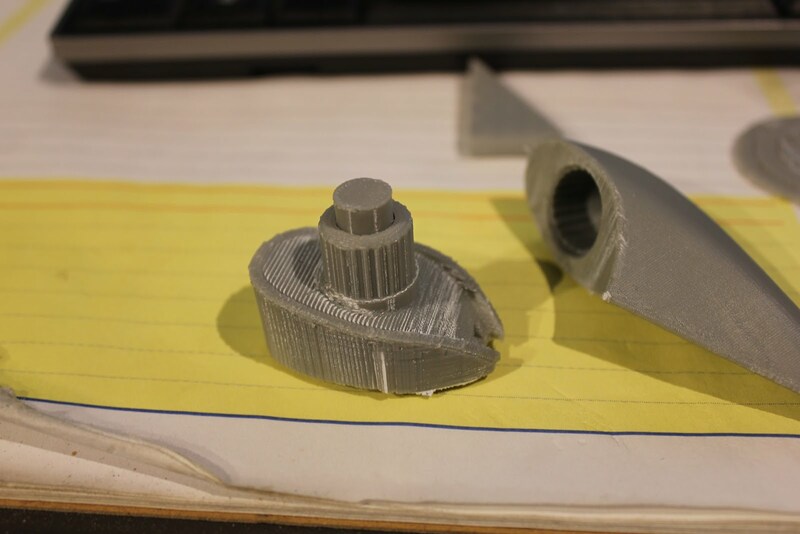 The 3-D printed component as it comes out of the printer after being removed from the build plate. It requires a scraper and quite a bit of effort to get into separate from the heated build plate. The support structure is laid down in such a fashion that it separates very easily from both the printed part as well is the base raft. If you look very closely at the raft you can see little Mosquitoes that got attracted to the printer and ended up getting fried into the plastic. Next we can pull the raft away from the support structure. Some areas are bonded better than others. Sometimes you simply have to take a pair of needle nose pliers and crush the support structure in order to remove it from the parts. 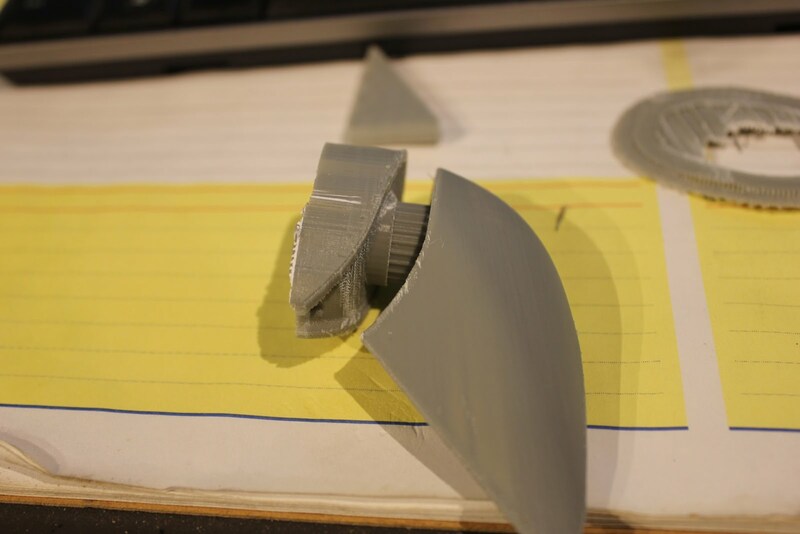 This shows how cleanly the support structure separates from the actual part itself. The quality on this Zortrax M 200 printer is quite spectacular. On this part the support structure separated from the part completely intact. You can see the internal serrations that are designed into the part that allow us to “clock” the part so that it will be perfectly streamlined after the installation process. The serrations are set up to be able to reposition every 15° of rotation. 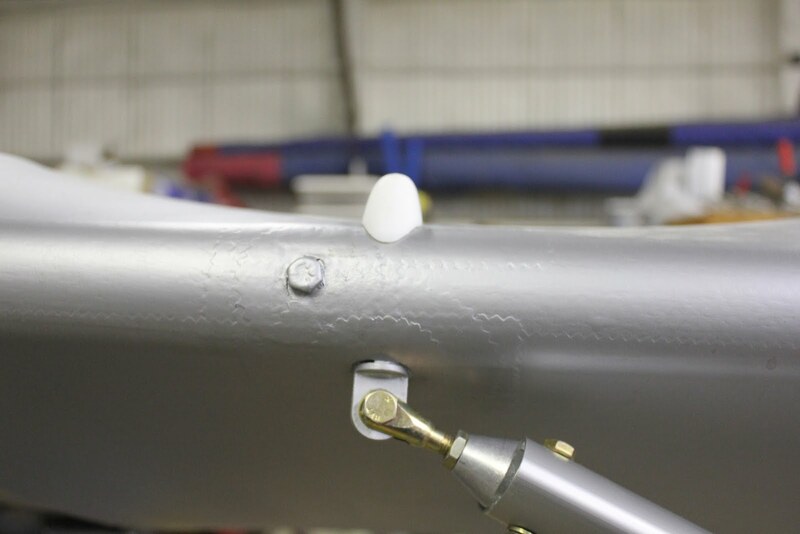 This allows us to be able to move the nut ever so slightly to obtain perfect in line orientation of the fairing. The internal structure of the fairing is also designed as a pressfit onto the outside of the nut that protrudes through the top of the wing. It becomes very rigid and requires considerable amount of effort to remove however during final installation we will probably use some kind of adhesive to ensure that it is semi-permanently installed onto the fastener. A rear view of the fairing. 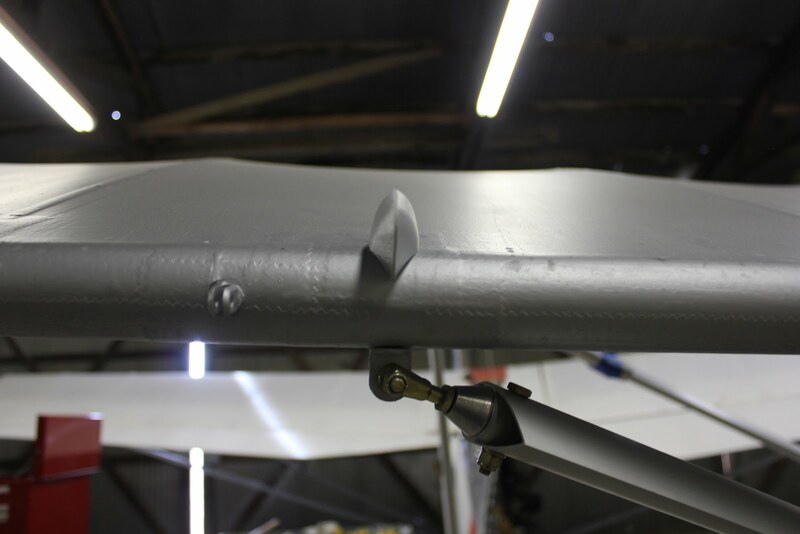 Large protrusions like the opposite end of the eye bolt that is used for the lift strut can be very disruptive to the airflow over that section of the wing. 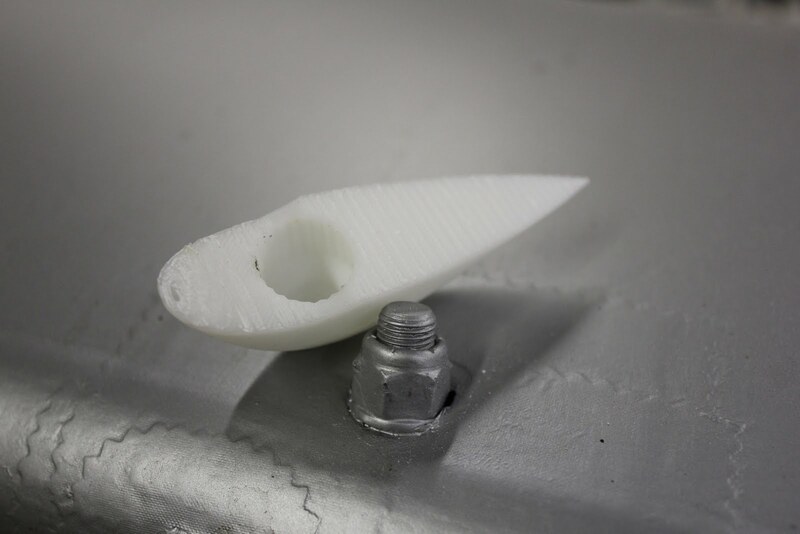 By 3-D printing a small fairing to capture the nut on the top side of the eye bolt significantly improve the airflow and reduce the drag. 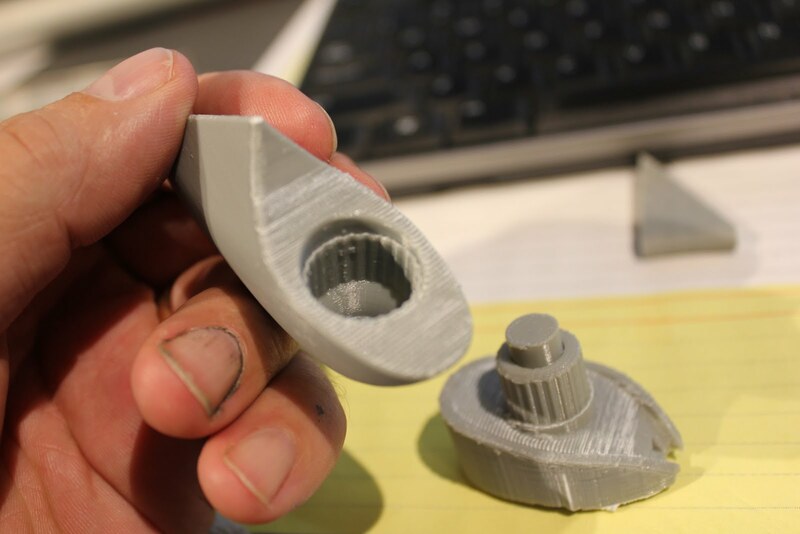 One of the big advantages of doing 3-D printing is that you can make multiple changes before you commit to a final design. 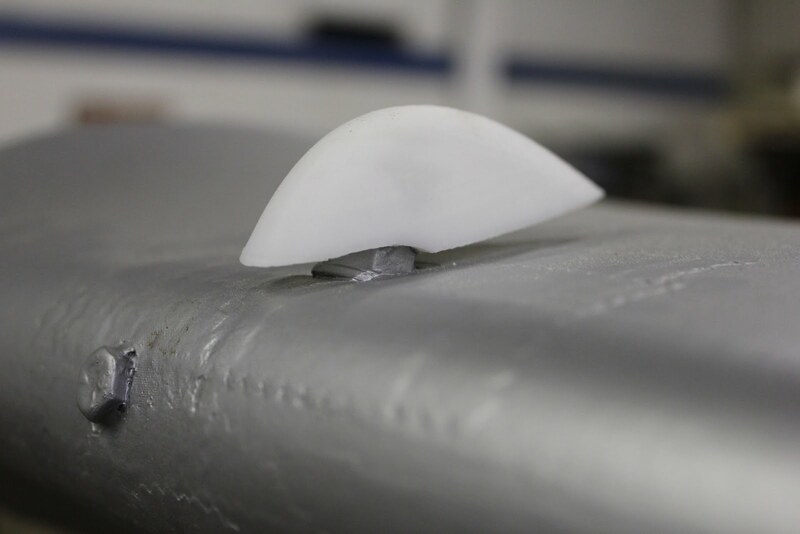 On the 1st go around we found that the fairing would not fit all the way down against the wing and that the profile for the leading edge was incorrect and the angle of the fairing against the fabric was also off slightly. On the 2nd prototype we were getting just a little bit closer but still didn’t quite completely fit flush with the wing. A front view of the fairing. This is the beginning of the prototyping stage for the wing strut fairings. 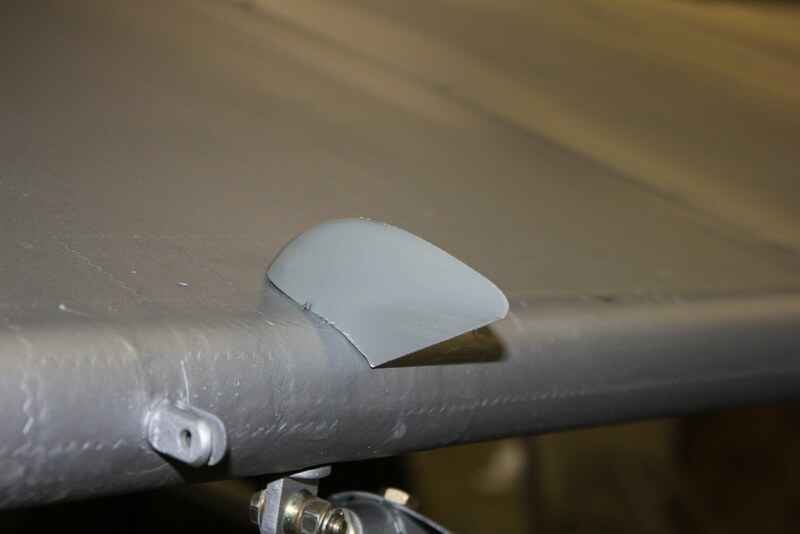 This will transition the airflow around the intersection of the wing strut and the wing. 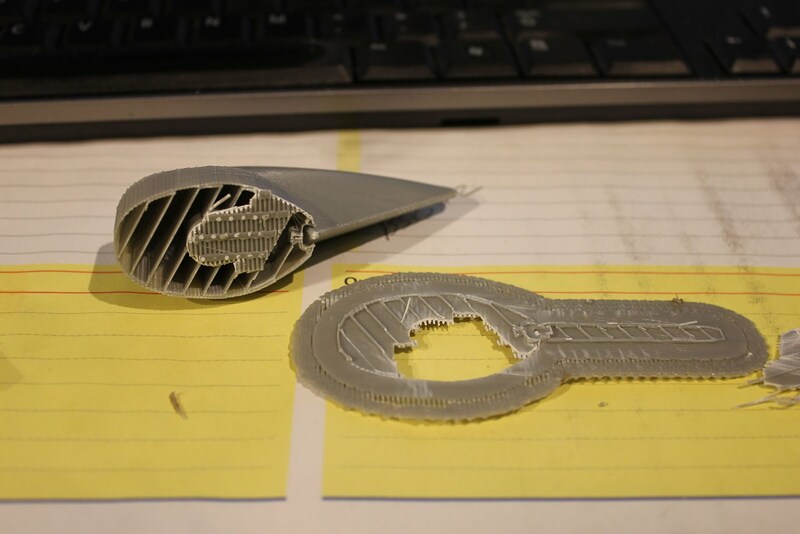 The viability of making these out of 3-D printed parts is somewhat suspect because of the timeframe necessary to print. This 3-D print here was 16 1/2 hours. 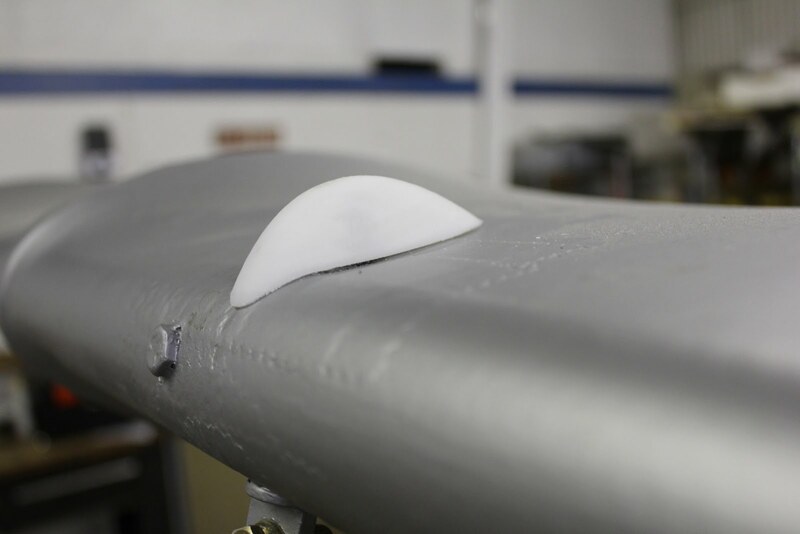 However the viability of testing the fairing using the 3-D printing process to ensure that the part fits before we use a different method of manufacturing is very useful. 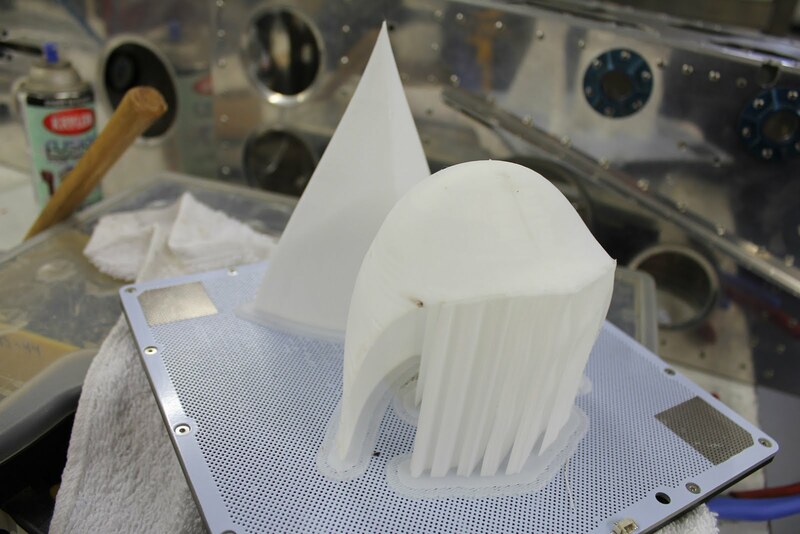 The most likely scenario is that we use the 3-D printing process to manufacture a mold from which we can vacuum form the fairings. 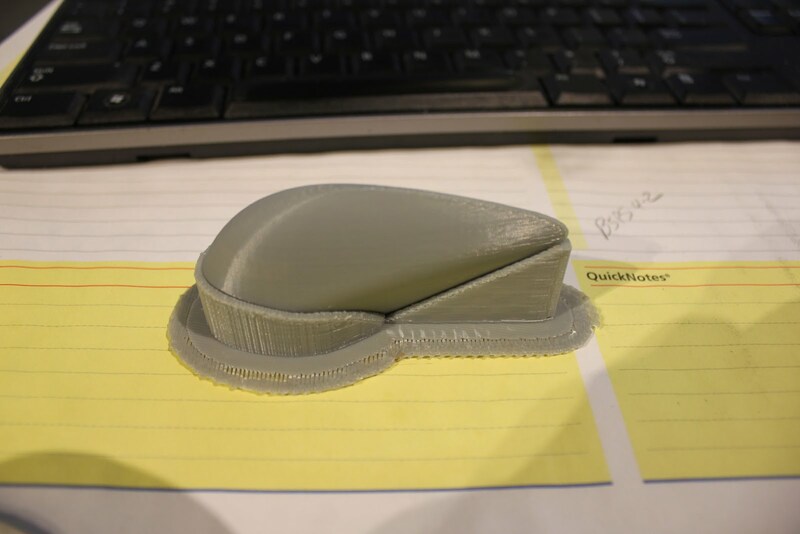 When printing components with large overhangs it requires that support structures be built up simultaneously during the printing process. The software allows for multiple options on how much or how little support structure is used. 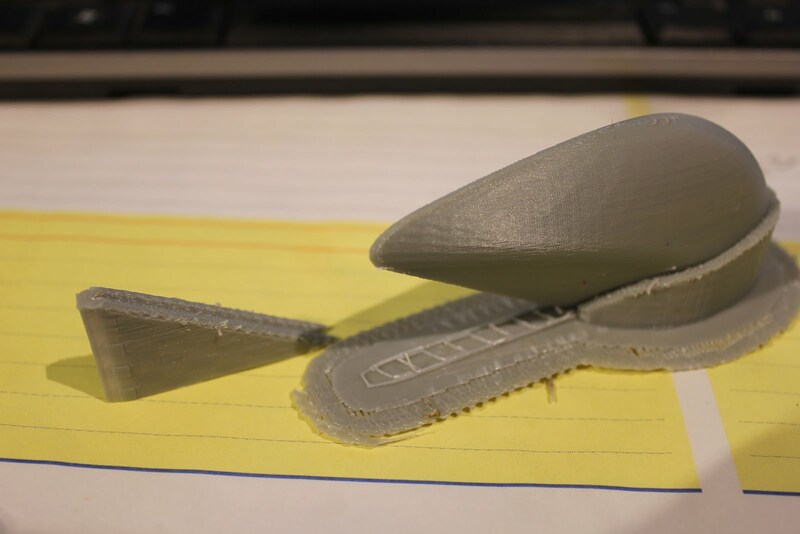 The wing strut fairing had to be split into 2 individual parts in order to be printed. Although the machine has a reasonable footprint when it comes to large components it’s not very compatible. This is okay because the timeframe necessary print parts any larger than this becomes so great that it becomes impractical.